As I was milking our Jersey, Spark, the other evening, I was thinking about how this was what I dreamed about for years. Living off the land, growing our food and getting milk from our own cow. Life is good! And then Spark swatted me in the face with her tail. 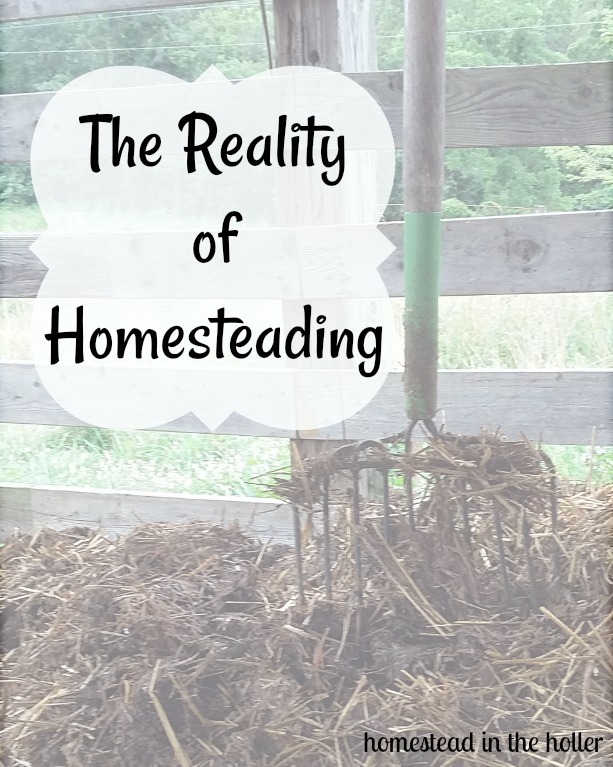 Everyone glosses over the realities of homesteading/farming. They show the good, happy parts of farm life and skip over the not so great stuff that nobody really wants to hear about. We’re shown the end result, the glass of milk or a clean basket of eggs, and all the stuff that happens beforehand isn’t mentioned. But isn’t the end result, the glass of milk and fresh eggs, the point? Yes, it is and it’s certainly the reward for a job well done. However, there is a romanticized view of homesteading these days. The white picket fence, well behaved animals, a perfectly weeded garden, cooking from scratch and still have time to sit on the porch with a glass of lemonade is what’s often portrayed on the internet. Getting swatted in the face by a cow’s tail or cleaning out the chicken coop that will really start to stink to high heaven if you don’t clean it, isn’t what you read about. While I love this life, there are some realities that are part of it; sweat, dirt, bugs and poop. Lots of poop.